I love the smokiness of this chorizo and chicken combination. As well as shaping it into meatballs, you could also use the mixture to fill pasta or make burgers. 1. Cook ½ the chorizo in a dry frying pan set over a medium heat until crsip - about 4-5 minutes. Using a slotted spoon, transfer to kitchen paper and set aside; reserve the chorizo oil and set aside to cool. 2. 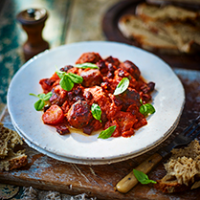 Pulse the remaining chorizo in a food processor with the paprika and ½ tbsp olive oil until finely ground. Add the chicken, ricotta, basil and cooled chorizo oil; season, then pulse again until combined but not too smooth. Fry a small pinch of the mixture to check the seasoning. 3. With wet hands, shape the mixture into 3-4cm balls (you should make 12-16) and set on a parchment-lined tray; cover and chill until needed. Thoroughly wash the food processor in hot soapy water. 4. For the sauce, cook the pancetta in a large pan set over a medium heat for 4-5 minutes, until just crisp. Add shallot and fry for 5 minutes, until soft and golden. Add the chilli oil, garlic, chilli, basil stalks, paprika, peppers and 100g fresh tomatoes, stirring for a few minutes until fragrant; season. 5. Stir in the tinned tomatoes; rinse the tin with a little water, adding this to the pan too. Bring to the boil, then reduce the heat; simmer for 35-40 minutes, stirring often, until thick and the tomatoes have broken down. Blend in a food processor, then return to the pan over a low heat. Add the remaining fresh tomatoes and most of the basil leaves; season. 6. Preheat the oven to 180"C, gas mark 4. Meanwhile, heat the remaining ½ tbsp olive oil in large, ovenproof frying pan set over a medium-high heat. Sear the meatballs, in batches if needed, turning often, for 4-5 minutes. Transfer to the oven and bake until golden and piping hot in the centre - 8-10 minutes. Divide between plates, spoon over the warm sauce, then top with the pea shoots and reserved chorizo and basil. Serve with crust bread, if liked.